But maybe you want to be a little different. Maybe you want to be a lot different. Or maybe you want to go to places so weird, isolated, or terrifying that it’s a stretch to even define it as odd. Well these are the places for you! Have you ever wanted to go from India to Bangladesh to India to Bangladesh to India? Then the Enclaves of the Dahala Khagrabari of the Cooch Behar District are for you! Enclaves are small districts of a country surrounded by another country. They’re fairly common around the world. Most are small and unremarkable. Kaliningrad, a Russian region separated from the rest of Russia by the Baltic States is probably the largest and most famous. The Spanish cities of Melilla and Cueta are surrounded entirely by Morocco and are the only European governed land on the Continent of Africa. Both have to be protected by large barrier fences. The Cooch Behar district of India and Bangladesh has 106 Indian Enclaves and 92 Bangladeshi enclaves. Basically each was drawn to ensure primarily Hindu villages would remain part of India while primarily Muslim villages would become part of Bangladesh. The strangest of all is the Dahala Khagrabari. An Indian enclave inside Bangladesh, which surrounds a Bangladeshi enclave, which surrounds an Indian enclave. Got it? Maybe you should just look at this simplified diagram. If you want to add to the excitement of your bucket list just keep going in the same direction which would mean you’d go from India to Bangladesh to India to… Oh never mind, you get the idea. Have you ever wanted to walk on an island where you are literally never more than a step away from a deadly venomous snake? Then Ilha da Queimada Grande, or “Snake Island” is the place for you! The Island approximately 20 miles off the coast of Brazil is a popular stopping point for migrating birds. For many of those birds it’s also the last stop as the small Island is almost literally crawling with Golden Lanceheads, a snake with venom which begins dissolving affected flesh within moments of being injected. As the venom quickly enters the circulatory system it begins dissolving other parts of its victim’s internal organs. In other words, it starts to digest its prey before actually swallowing it. Local legend states that there are up to five snakes per square meter, or about ten square feet. Since the room you’re reading this in is probably around 200 square feet that means there would be about 100 in there with you. Fortunately scientific censuses have estimated that the number is no more than about 1 per square meter. So relax, there would only be about 20 deadly snakes in the room with you. The Brazilian government has wisely determined that this is not a place which should be visited so only well protected scientific expeditions are allowed. So if you want to go here you’ll have to do it illegally. We also suggest that you make it the last place on your list to visit since you’ll likely kick the bucket pretty shortly after arrival. Have you ever wanted to go to an uninhabited region so devoid of development and resources that nobody even claims it? Then the Bir Tawil is the place for you! The Bir Tawil is a section of the Sahara between Egypt and Sudan which was part of a survey error around 100 years ago. One side put the land in Egypt, the other in Sudan. But unlike every other conflict in history the two sides have never argued over who owns it, but rather who has to take it, making it the geographical red headed stepchild. With no residents, no infrastructure, and no resources, this 800 square mile space is the only land on Earth, other than Antarctica, not claimed by any nation. So enjoy putting this nice conversation piece on your bucket list. We’re just not sure how you’ll get there. Editor’s note: A father from Virginia, Jeremiah Heaton, has fulfilled every little girl’s dream (and every sane parent’s nightmare of a spoiled child) by promising his daughter she could be a princess, and has began the process of owning Bir Tawil. Personally, we at TopTenz think that he has set the bar too high, too soon, for gift giving in his family. Imagine what they sweet 16 party is going to look like. Much of the world’s population lives near the coast. Much of the world’s known marine life also lives near the coast. Have you ever wanted to get so far away from both that you literally couldn’t be farther away? Then the poles of inaccessibility are for you. The oceanic pole of inaccessibility is at approximately 48 degrees latitude south and 123 degrees longitude west. Or about 2500 miles southwest of Santiago Chile. The nearest known land is a small island in the Pitcairn Islands approximately 1700 miles away. This is not along a major shipping lane either so it’s possible this is the least visited point on the entire Earth. If water isn’t your thing there’s a pole at approximately 46 degrees north latitude and 86 degrees east longitude in northwest China close to where Mongolia, Russia, and Kazakhstan all converge that’s approximately 1700 miles from any coastline. Or as far away as you can get from the sea. Like so many other places on this list it is pretty remote and an extreme environment, so good luck getting there! Has it always been your dream to visit a village where the buildings are just hollow shells which lack fixtures or interiors? A village which is “inhabited” by soldiers and citizens who seem to show up in shifts? Then Kijong Dong is the place for you! 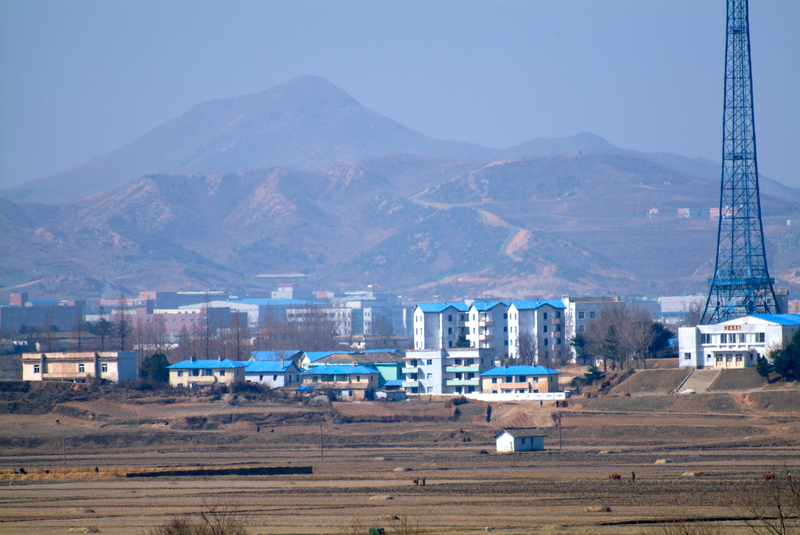 Kjong Dong is popularly known as North Korea’s propaganda village. It’s their only settlement inside the Demilitarized Zone and the only settlement in North Korea visible from South Korea. Unlike the drab and dreary utilitarian structures which make up the rest of the country Kijong Dong is built with very aesthetically pleasing architecture. It’s also surrounded with lush fields being cheerfully worked by happy looking residents. It was built shortly after the cease-fire which ended the Korean War as propaganda to convince South Koreans to defect to the north. It demonstrated a standard of living well above that of anywhere on the Korean Peninsula at the time as the south was also a very primitive country. Simply viewing the village with binoculars will reveal that the buildings have no windows, no interiors, and electricity seems to come on at a uniform time. The village also has a constant military presence and the fields seem to be worked only by actors and other loyal citizens who are clearly putting on a performance. So if you want to see what life is really like in North Korea (wink wink) then sneak across the border and have a gay old time in Kijong Dong. Just be prepared for the fact that it’ll probably be a one-way trip. Has it always been your dream to visit a brand-new immaculate city with fancy theaters, shopping malls, and restaurants? Better yet has it always been your dream to have the place almost entirely to yourself? Then one of China’s several ghost cities is the place for you. It’s no secret that China’s economy has taken off in the past 20 years as it has transitioned from a simple communist country to a capitalist industrial society. As other developed nations transition from an agricultural to industrial society the population usually transitions from mainly rural to urban. As a result great cities are built up around the industrial areas. China has taken the opposite approach by building beautiful cities in the hope that industry and financial centers will follow. As a result there are several locations with beautiful housing and luxurious services available for millions, but are currently inhabited by a small fraction of that amount. Needless to say this is a very risky investment. Calling them ghost cities is also a bit of a misnomer as a ghost town is usually associated with a once great place whose economy collapsed and was abandoned by its citizens, leaving nothing but the ghosts of the past. What we have in China is either foreshadowing, or a great place to film a zombie apocalypse movie. So head on over and someday you might be telling people that you remember when nobody was there. Have you ever wanted to visit a place where more than half of the nights every year there’s an all night lightning storm? Then the Catatumbo river mouth along Venezuela’s Lake Maracaibo is the place for you! It’s a very unusual phenomenon where almost every night shortly after sunset in the same location a huge thunderstorm forms and produces an enormous amount of lightning for up to ten hours. An explanation won’t do it justice, just watch this video and see what happens all night long 200 nights a year. The odd thing is that there is no obvious explanation for why this particular spot is so affected. The river mouth is a swampy bog which may have an unusually high level of methane. The river mouth is surrounded on three sides by mountains so air is easily trapped allowing for the static discharge. But there are many other sites on Earth which can make a similar claim. So why something so violent, but so beautiful, happens here at such an alarming frequency is unknown. Needless to say a lot of myths and legends abound about the phenomenon. It is also becoming a fairly popular place to visit as the show is spectacular. It’s just best enjoyed from a distance. If you want to experience it up close have fun standing in knee deep water with electricity raging all around! Have you ever wanted to go to a volcanic island so inundated with sulfur that residents have to carry gas masks at all times? Then Miyakejima on the Izu Islands is the place for you! The Izu Islands are a string of volcanoes extending southward from the main Islands of Japan. Since the islands are volcanic they sometimes have, well, volcanic eruptions. The blasts and spewing lava have resulted in many deaths and frequent evacuations. This also means almost constant emission of dangerous levels of sulfur dioxide. A small dose of sulfur dioxide is fairly harmless, a larger dose can cause permanent lung and tissue damage. 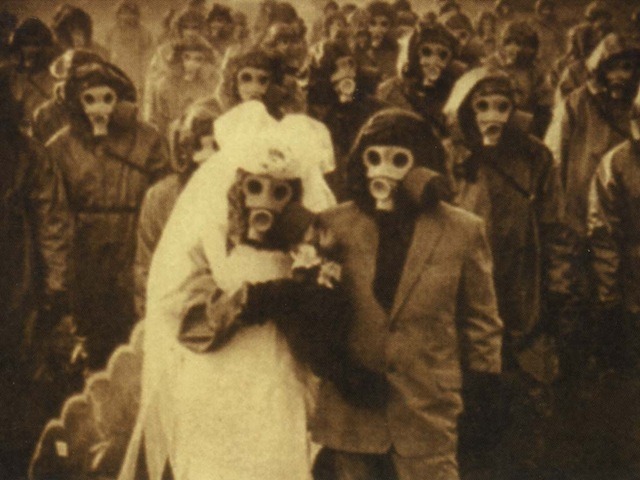 The doses residents of Miyakejima receive on a frequent basis is fatal, therefore it’s mandatory that all residents carry gas masks with them at all times. Surely that’s just a precaution right? After all we all have smoke detectors but rarely use them. Wrong. Many parts of the island cannot be visited without a mask, and many residents wear them whenever sleeping or when there’s not a good reason not to wear it. You’ll be glad to know that other tourists do visit the islands and are provided their very own disposable masks. Just know that your selfies will not be very remarkable since you’ll look just like everybody else. Have you ever wanted to look to tomorrow? How about go back a day? Then the Diomede Islands are for you! These small islands in the Bering Strait are separated by about two and a half miles, and are a world apart. The inhabited little Diomede Island (and by inhabited we mean about 100 people) is part of Alaska. The uninhabited Big Diomede Island is the Easternmost part of Russia. While this isn’t quite as politically significant as it used to be, one should remember that the Earth is separated into 24 time zones. Somewhere they had to mark where the date changes as well, so we have the aptly named International Date Line . The International Date Line was drawn north-south through a region which was as ocean covered as possible. It roughly follows the 180 line of longitude, but zig-zags a little to ensure as little disruption as possible with political boundaries. The Diomede Islands is the closest the line runs between two land masses. The result is that anyone looking west from the village of Diomede is actually looking 21 hours ahead (time zones aren’t straight either) and seeing the future! While anyone who looks east from Big Diomede is seeing the past! In addition to the eerie sense of clairvoyance you’ll feel you’ll also have the pleasure of being in an environment where winter temperatures average below zero, but shoot all the way up to around 50 in the summer! Of course those balmy temperatures are nullified by cloud cover about 80% of the time and near constant winds in excess of 20 mph. Getting there is a bit of a task. Since the island is just the tip of an underwater mountain there is no flat land, aka place to build an airport. Since it’s always windy there’s no place to build a seaport either. So helicopter is your only real option. Enjoy! Has it always been your dream to be as far away from the center of earth as possible? Then Chimborazo is the place for you! The 20,564 ft peak in Ecuador has the distinction of being the point farthest from the center of the earth. Now how can that be if Mount Everest is more than 8000 feet taller? Aren’t there even other mountains in the Andes range which are taller? Yes, but note that it’s in Ecuador. A country whose name sounds remarkably close to equator. That’s because the equator goes roughly right down the middle of the country. True to form Chimborazo sits at a mere 1° South latitude. The earth is not perfectly round, it’s more of an oblong shape and bulges near the equator. The result is that areas closer to the polls are closer to the center of the earth while areas closer to the equator are farther. Mount Everest is hardly near the poles. In fact it’s only at 27° North latitude which puts it much closer to the equator than it does the poles. But each degree north makes a difference of a few hundred feet from the center of the earth resulting in Sea level at that latitude being about 10,000 feet closer to the center than it is at the equator. That’s enough to give Chimborazo a 2000ft advantage in claiming the unique title. Even though we associate warm temperatures with being closer to the equator, nothing at 20,000 feet is warm. Chimborazo is permanently covered in a thick ice pack in glaciers and only the most experienced climbers are suited to go there. So if you want to cross this one off your list you’d better get a good guide. Good article! Those are some great places to add to your bucket list.